Tomatoes are a challenge to grow in the Arizona desert during the summer months. The offset is that tomatoes will grow and set fruit longer in the fall and winter than in other areas of the country. It's not unusual to have tomatoes ripening in the garden in December and January if there haven't been any frosts. The high temperatures and low humidity of Arizona summers causes several problems for gardeners. Cracked skins are due to inconsistent watering. The ripening fruits shrink back when deprived of water and then expand when water is available causing the skin to crack. The cracking is unsightly and doesn't affect flavor unless the skin has been breached completely and the interior of the tomato is exposed to insects. This is the major challenge with tomatoes in the dry Arizona desert due to blossom drop and lack of pollination. Tomatoes bloom and set fruit when the temperatures are between 70 to 90 degrees Fahrenheit for highs with nighttime temperatures between 55 and 75 degrees. Blossom drop occurs when the weather is too hot or too cold. Inconsistent watering can cause it, as well as over or under fertilizing. Heavy fruit set may prohibit new blossoms from setting fruit so they drop off. Lack of pollination is the other reason for low to no fruit set. Humidity should ideally be between 40 to 70 percent for tomato pollination. In Arizona highs go above 100 degrees for days at a time during the summer and don't get below 80 degrees. Humidity is often between 10 to 20 percent. The pollen doesn't stick to the flower during low humidity. Hosing off the plant may raise the humidity enough for the flowers to be pollinated. The bottom end of the tomato turns dark and leathery and looks as if it's rotted. The fruit is not edible at that point. Blossom rot is caused by lack of available calcium. Under watering or light frequent watering makes it more difficult for the plant to assimilate the calcium. Long deep watering strengthens the root system which allows the plant to use the calcium in the soil. 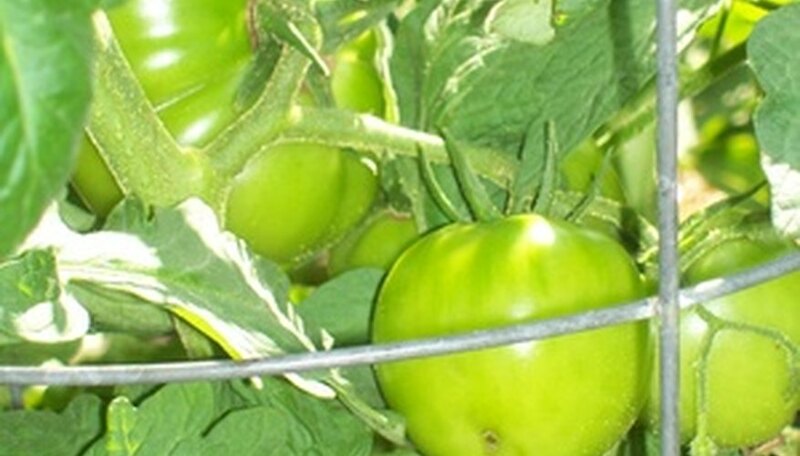 Curly top virus occurs even in those strains of tomato plants that are resistant. The leaves at the ends and top of the plant begin curling inward and drying up. Eventually the entire plant dies. Curly top virus is spread by beet leaf hoppers. Once a plant is infected, control is difficult. The best remedy is to remove the infected plant so other plants don't become infected by the leaf hopper going from one plant to another. Tomato hornworms are the caterpillar of the sphinx moth. The hornworm is green with a distinctive horn at one end. It eats the leaves off the plant, stripping it of vegetation. Control is to hand pick the hornworms off the plant and dispose of them.